"Many times when I am painting, I am unaware of what I am painting, I only know that I am painting. I am often shocked when I see the finished product. A dealer once suggested I was taken over by the spirit of Georgia O'Keefe. Well, not to my knowledge. Though there are times I begin painting a landscape only to wind up with a flower. I start a still life, it turns into a flower. There are times I feel as though someone other than myself has taken over my brush. " Jordan says, "I see life as a metamorphosis, an infinity, a cyclical flow of energy. A universal energy with no beginning and no end. I paint that energy. When I paint a flower, I am that flower. Sometimes when I paint, I am unaware of what I am painting ------ Only that I am painting." Jordan studied art at New York.s famous Art Students League. She studied anatomical drawing with the famous artist "Gustav Rehberger through whom, "I learned to see as well as sense the life and motion in the human form. Gary Faigan gave me the structure and the wonderful Michael Burban the joy and sense of accomplishment. Through Richard Goetz I learned to see form, colors and composition. Hilary Holmes gave me a knowledge of the palette and the discipline necessary to paint realism, while Nelson Shanks taught me the difference between sketching and painting a portrait. Thomas Fogarty and Oldrich Teply taught me to see and express freely what I saw and gave me the faith in myself not to doubt my abilities. The famous abstract artist, Richar Pousette -Dart gave me an understanding of abstract thought and emotion. This understanding gabe me the freedom to express my feelings in abstract . Jordan has enjoyed an unusually broad and diversified background in the creative arts. Her artistic activities began in childhood, as a dancer, actress and singer. She has performed on stage and screen, and sung in concerts, clubs and on TV in the states as well as abroad. Her repertoire ranges from Puccini to jazz. During her most active years in the performing arts. Jordan spent as much time as possible on her art work. She designed fabrics, jewelry, sculpted in stone and clay. Her hand painted ties and bottles were sold in several of the chic Madison Avenue Boutiques. Jordan is mediagenic and therefore no stranger to the media. She has been interviewed by numerous radio and TV talk show hosts as well as having lots of spots on the local and national news shows. New York Post's famous Cindy Adam's wrote about Jordan in her column along with numerous others who are fascinated with her psychic celebrity portraits. 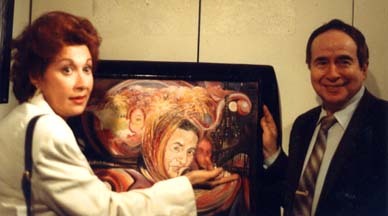 She was interviewed by NBC News among others about her her portrait of John Lennon entitled "Strawberry Fields." 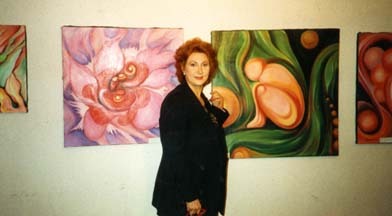 Jordan has had numerous art shows in the states as well as abroad. 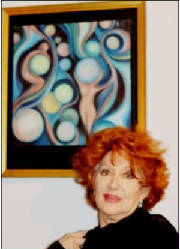 Her works hang in collections around the world. Her psychic impressionist portraits have made her a favorite of the celebrity world and her visionary paintings and impressionist florals have been shown in New York City's most famous galleries. Jordan was one of the few artists chosen to be represented by the world famous Grand Central Gallery until its close. Jordan accepts commissions for portraits of people and pets, and enjoys working with interior designers to create paintings designed to conform with the special needs of their clients. Jordan's paintings, originals as well as copies are available for sale online and off. You can commission a one of a kind painting on canvas or wear it on an article of clothing. Jordan can also be heard singing in clubs in NYC and the tri state area. Jordan is director of New Apple Productions.